It is a very interesting how the strangest and even disturbing conditions can bring two people together. 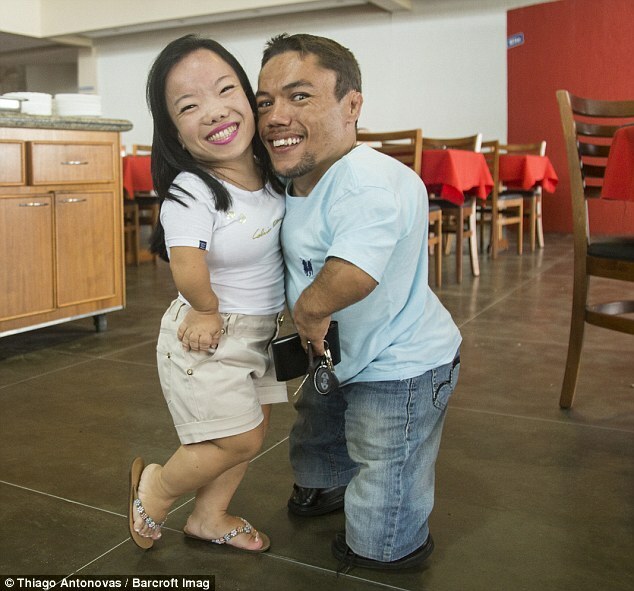 The world’s shortest couple, Paulo Gabriel de Siva and Katyucia Hoshino, both from Brazil, have tied the knot. The couple who measure 38.8in and 35.2in respectively, met on social media and dated for four years before tying the knot. The couple who hope to enter the Guinness Book Of World Records explained their challenges and how they met. RELATED: How to eat bitter kola: Can you eat Bitter Kola with a straight face? According to Paulo, who has a rare genetic condition called dystrophic dysplasia dwarfism, had said it was love at first sight for him. The attraction wasn’t however mutual for his new bride, who suffers from Achondroplasia dwarfism, a condition that affects bone growth. She explained that wasn’t interested in him initially because he was annoying and had cheap pickup lines. Katyucia added that she had never dated anybody before Paulo, and he was her first boyfriend. The couple said the relationship is what they have both dreamt of because they have companionship, closeness and love for each other. The smitten couple are open to the possibility of having children in the future. They got engaged in August 2016 during a sushi dinner.